Historian Eddie Herdendorf opened the show by letting us in on a little Sheffield history. Lorain County Metro Parks Ranger Brian Holmes talked about his involvement in the parks and the nature that can be seen in Sheffield. Pam Coghlan, of the Domonkas Library, talked superheros, books and Harper Lee with Bruce and Craig. In our final segment, the spotlight shined on business with the North Coast Chamber of Commerce’s Ray Gilles and John Sobolewski. Volunteers play a large role in maintaining the Sheffield Public Parks. Ruth Horvath, from Friends of the Lorain County Metro Parks, Let us know about her experiences and how others can get involved in the program. History, future plans, bicentennial events, and more. Sheffield Village Mayor John Hunter shines the light on his village. From scavenger hunts to golf outings, the Lorain County Metro Parks has some great times ahead for the summer. Vanessa Klesta, Public Information Officer for the LCMP, lets us know all about the upcoming fun events. It started as a college Branch of Oberlin and later became a station on the Underground Railroad. The Burrell Homestead has been a huge part of Ohio History since its construction. Burrell Homestead’s, Matt Kocsis told us about the importance of this historic landmark. 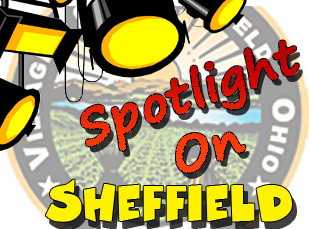 Sheffield Lake Mayor Dennis Bring stopped in to shine the spotlight on his city. The History of the Burrell Homestead dates back to a time even before the Burrell’s. Curator and John Otis Hower Chair of Archaeology at the Cleveland Museum of Natural History, Brian Redmond let us know about the history that is currently being unearthed at the Burrell Homestead. Let’s take a walk. Jennifer Bracken, Assistant Director of the Lorain County Metro Parks, spoke with Bruce and Craig about the Silver Sneakers program. Some big plays are coming to the French Creek Nature and Arts Center. Rick Fortney, Artistic Director of the TrueNorth Cultural Arts, announced the new season’s schedule, and he previewed the Pajama Game which is currently playing at the French Creek Nature and Arts Center through July 26.